Illustrated fiction, informational texts, and engaging exercises improve reading for enhanced learning across disciplines. 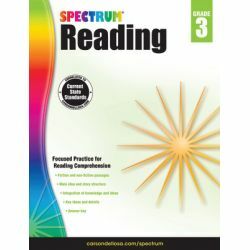 Spectrum® Reading for grade 3 is a fun, standards-based language arts workbook that strengthens reading comprehension skills by increasing children's ability to understand, process, and analyze text. Strong reading skills are the basis of school success, and Spectrum Reading for grade 3 will help children triumph over language arts and beyond. This standards-based workbook uses engaging text to support understanding key details, knowledge integration, story structure, and main ideas. 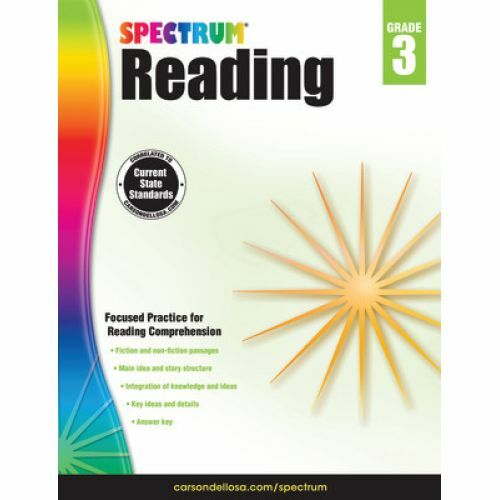 Spectrum Reading will help your child improve their reading habits and strengthen their ability to understand and analyze text. This best-selling series is a favorite of parents and teachers because it is carefully designed to be both effective and engaging—the perfect building blocks for a lifetime of learning.